Smoking prevalence among students in grades 6-9 varied by province in 2014-15, although this difference was not statistically significant82 (Table 8.1). Specific prevalence estimates for 2014-15 for most provinces cannot be reported, due to unacceptable quality. 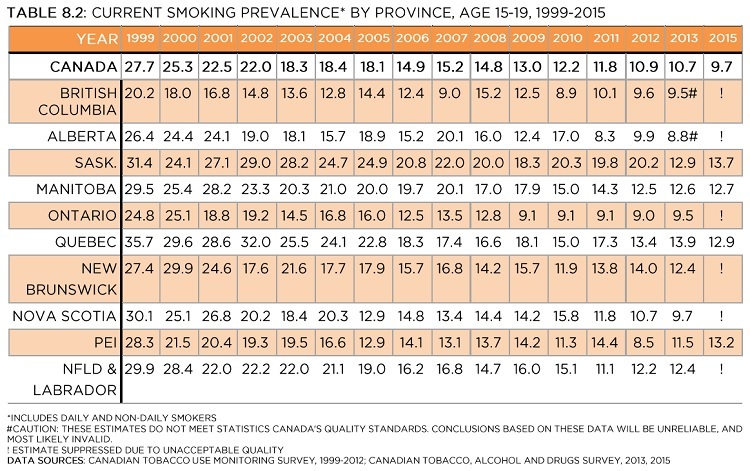 In the decade from 1994 and 2004-05, smoking declined substantially in all provinces; although small increases were observed in some provinces in the waves that followed, prevalence appears to have decreased to 2004-05 levels or lower in most provinces in recent waves (Table 8.1). In 2014-15, prevalence had declined to levels too low to report in most provinces. British Columbia 7.7 2.3 ! 3 3.2 2 1.1 ! Alberta 7.5 ! ! ! ! ! 1.1 ! Saskatchewan 6.1 3.2 2.1 ! 6.1 4.3 2.2 ! Ontario 4.6 ! 1 1.9 1.4 1 0.8 ! Quebec 14.1 7.6 4.3 5.2 7.6 4.3 4.4 ! Nova Scotia 7.6 4.6 2.9 3.8 2.8 3.3 1.9 ! Island 7.7 ! ! 2.3 2.2 ! ! ! Labrador 9.3 5.9 3.8 ! 5.6 4 1.7 ! **Exact estimate suppressed due to unacceptable quality. The upper bound for the estimate is less than 2%. a In 2010-2011, New Brunswick declined participation in the Youth Smoking Survey (YSS). b In 2012-2013, Manitoba declined participation in the YSS. c Provincial estimates for New Brunswick not reported because the Canadian Student Tobacco, Alcohol and Drugs Survey (CSTADS) did not achieve a generalizable sample of New Brunswick students in 2014-2015.
! Estimates suppressed due to unacceptable quality. Data sources: YSS 1994, 2002, 2004-05, 2006-07, 2008-09, 2010-11, 2012-13; CSTADS 2014-2015. 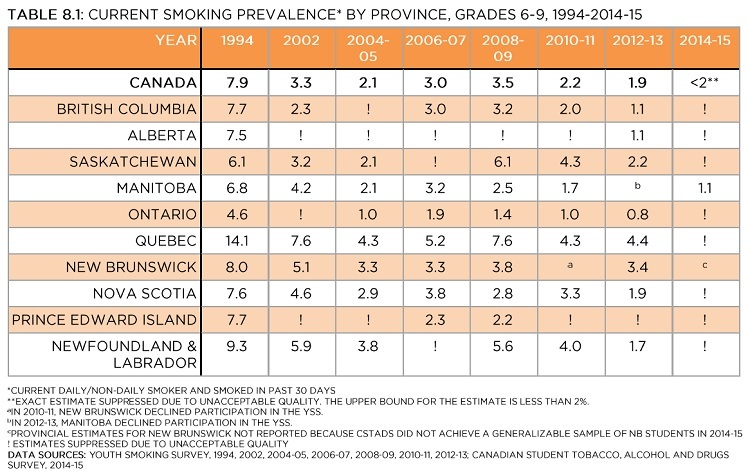 Among youth aged 15-19, the variation in smoking prevalence between provinces was not statistically significant in 2015 (Table 8.2).83 Saskatchewan had the highest provincial prevalence estimate, at 13.7%. Many provincial prevalence estimates for 2015 cannot be reported, due to unacceptable quality. Since 1999, smoking prevalence among youth has decreased by more than half in Canada, as well as in all provinces (Table 8.2).